Wallpaper gives you the opportunity to create illusions that weren’t there before. When Ellie designed her original ‘Dark Floral’ Wallpaper, she had a statement wall in mind. But some of her clients, Amber Lewis of Amber Interiors and Emily Schuman of the blog Cupcakes and Cashmere, had a different vision for it. 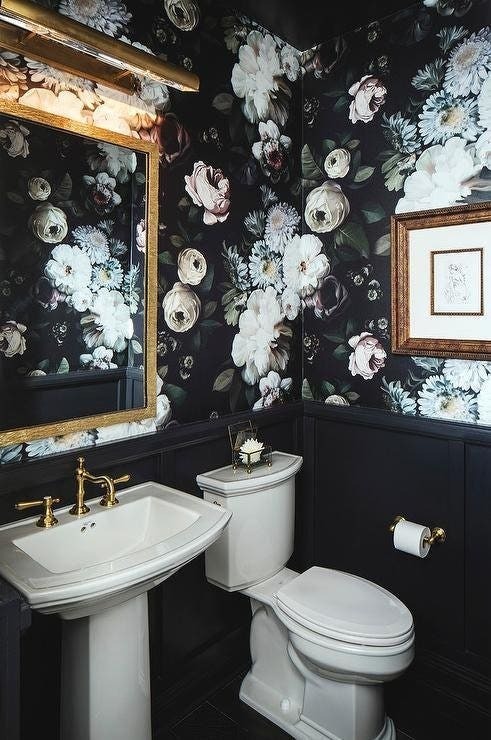 Their idea was to apply this large, dramatic print to a small powder room space (including the ceiling). The ‘before and after’ photos they shared in February of 2014, just a few months after we had launched our web shop, show what wallpaper can do for a space like this.